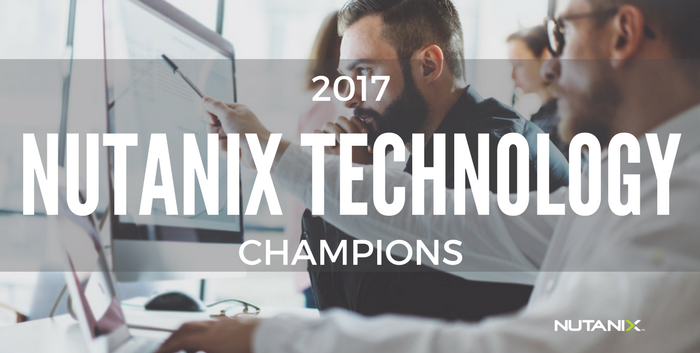 I am excited to announce the 2017 group of Nutanix Technology Champions (NTC). Each year, we continue to see incredible interest and demand from the vCommunity. On behalf of the entire community team here at Nutanix, we are grateful and excited about the upcoming year and collaborating on some really cool stuff. The Nutanix Technology Champion program is a truly global program and is composed of IT professionals from every cloud, application group, and technology. They are committed to news ways of thinking that will enable their organizations to deliver on business outcomes. I am looking forward to getting to know you all and will be contacting our new NTC members shortly with more details. Take the time to congratulate one another, and if you are sharing on social, use #NutanixNTC so other's can engage in the conversation. Congrats to all of my fellow NTC'ers! Congratulations to all and it's a pleasure to be among the crowd! Congrats to all of you .... awesome community! Great to be part of this! Congrats to all 150 people who made the list. Congratulations to the new champions! I'm excited to be part of this community! Congrats to everyone! I look forward to being apart of this group!